Following up on my post from last week on attaining the Elgato Game Capture HD, this week I’m going to go more in-depth into the experience of actually using it. One caveat: I will be discussing its use relative to capturing from the PlayStation 2, GameCube (here in part 1), and PC (next week in part 2). While I have not used my Elgato to capture from any current consoles, based on what I’ve learned about the device so far, I’ve no doubt it would work like a charm. 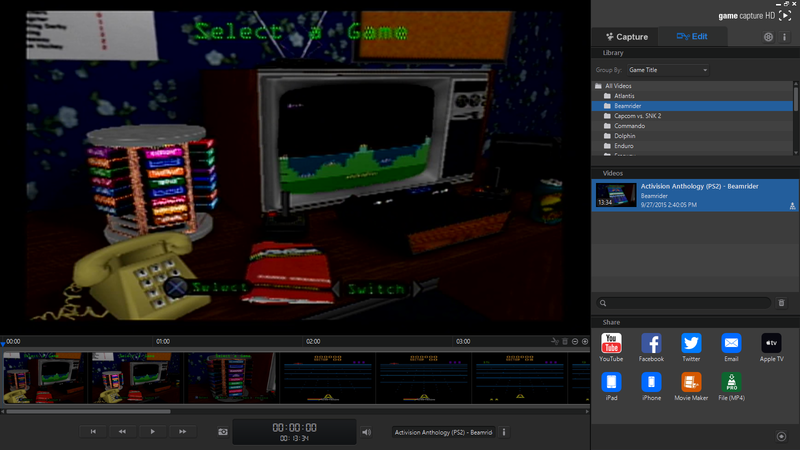 The bottom line is that I recommend the Elgato Game Capture HD, especially if you want to record from older consoles. So, to recap from my previous post, I became the proud owner of an Elgato Game Capture HD last month. After doing my research, and keeping in my mind goal to capture footage from our PlayStation 2, GameCube, and my laptop, the Elgato turned out to be the best bet. The device’s online manual promised that it was perfectly useable with older consoles and a multitude of novice and seasoned reviewers confirmed this. Purchasing the thing was a snap, and it was in my hands before I knew it. Let’s get some of the technical bits out of the way first. You can view the device’s specs in full detail on the Elgato site, but this picture sums up everything you need to know. On one side is a USB port that’s used to connects the Elgato to your PC and an HDMI-out to connect the Elgato to your TV. On the other side is an HDMI-in for your newer consoles (and it comes with a special adapter for the PS3), and then there’s the A/V port for the Elgato’s own component adapter, which is what, for me, pushed the Elgato to the top of the list. The Elgato’s component adapter. If ever there was a more beautiful cable, I’ve not laid eyes on it. The component adapter allows you to hook the Elgato up to any console that uses either component or composite (RCA) cables. (You can also use it to capture via S-video, but an additional analog video adapter is needed, and you have to get that yourself.) For an old person with old consoles and an old TV, the component adapter is my lifesaver! And because the Elgato can capture at a number of different resolutions, from 1080p all the way down to 240p, it translates non-HD video. Again, this is a huge plus for me and my non-HD TV. Speaking of which, the one thing that’s not mentioned in any of the Elgato text is how to hook up the Elgato Game Capture HD to both a TV and console using only composite cables. In other words, we have our PlayStation 2 and GameCube connected to an old TV that only has composite ins and outs; no HDMI ports anywhere to which to connect the Elgato! So how the heck did I deal with that? I turned to the trusty, ol’ Internet, and the answer I found was pretty simple. With these beauties, I can split the signal from the Elgato to both the TV and the game console. The results are perfectly acceptable, as you can see for yourself on our YouTube channel. The only thing the device does not come with is an old-fashioned CD with the capturing software, because in this day and age, who the heck uses CDs anymore! 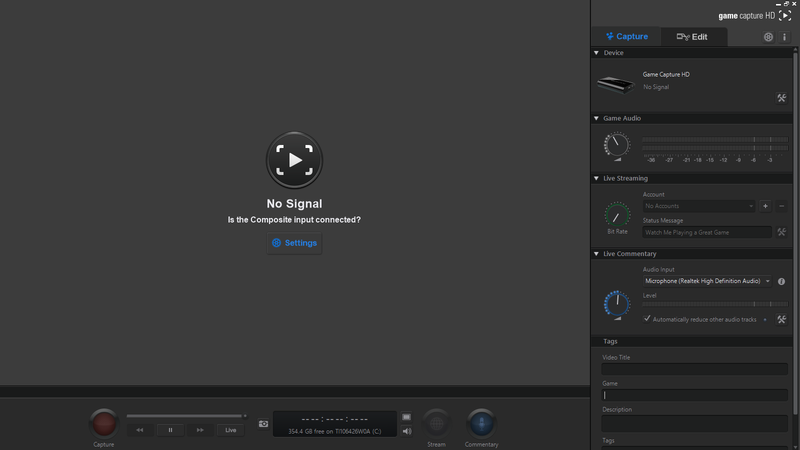 For the Elgato software, you simply download the latest version from their site. Easy peasy. The Elgato program is not unlike others that I’ve seen. It allows you to (1) capture video, (2) capture video with commentary, either live or in a separate track, (3) livestream video and commentary (or so says the manual; I’ve not tried this), (4) do some basic video editing, like cutting and moving around segments, and (5) upload your video to your own files, as well as sites such as YouTube, Facebook, and Twitter. In addition, the settings are highly adjustable, allowing you to choose the device from which you’re capturing (with an “Other” option for any retro consoles), as well as the particular input, from HDMI to composite. You can also adjust the resolution and quality, though I’ve found that the default settings work well enough for my PS2 and GameCube, and frankly, when it comes to no-HD video, there’s not much difference between capturing at “good” quality over “high” quality. At high quality, the end results looks a little less grainy, but the video takes f-o-r-e-v-e-r to download. Overall, when it comes to capturing video from my PlayStation2 and GameCube, and recording the silliest of silly commentary, I couldn’t be happier with the Elgato Game Capture HD. But this isn’t the end of the story. I’ll be back next week with part two of this medley that will be all about the Elgato and using to capturing from the same PC to which it is connected. It’s a hardscrabble tale of woe and triumph that breaks down the barriers between humans and technology! Or…maybe it just involves more cables. I love my Elgato… Definitely the most stable of all the game captures I’ve tried, even when I’m recording new consoles in 1080p. So many others would crash on me if I recorded more than 20 mins of gameplay. Elgato software runs like a dream. Wait, you can capture your PC? I’ll be looking forward to that post!! That’s awesome! Things have been really great with the Elgato so far, and I don’t regret the purchase at all. I hit a number of hiccups with PC recording, but I think I’ve got it figured out. I think…anyway. Well I definitely look forward to that post! I’d love to record Sims 4!